Could Portland be America’s Best Cocktail Town? The craft cocktail craze of the past 15 years has advanced the sipping options through out the country. In most every town you can find a well-crafted, interesting cocktail. But Portland, Oregon could be my favorite. In a town known for off-beat locals who take conventional pre-occupations casually they are fanatically particular about their cocktails. If a millimeter larger ice cube is “best”, then they hand chip one to order even if it takes 5 minutes. Unlike San Francisco, New York or even Seattle, Portland is compact and un-crowded, making it easy to stroll between a dozen unique cocktail lounges in a few blocks of Downtown and the Pearl district. 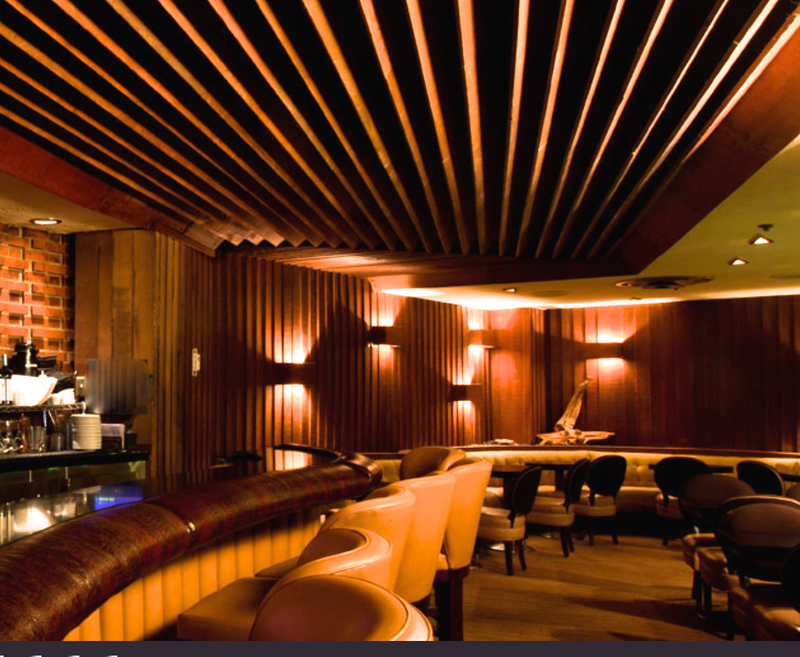 Kask is a petit, convivial lounge displaying a collection of quirky Americana. We sit at the bar and watch Erin pull from a large selection of spirits and construct signature drinks. She is right to recommend the fried salmon fingers with aioli, a rich mouthful that truly needs a firm cocktail as a palate cleanser. Erin asks what other lounges are on our agenda. When we mention that we always love the venerable Clyde Common she suggests we add Pepe le Moko, a tiny basement establishment opened by the Clyde Common folks. 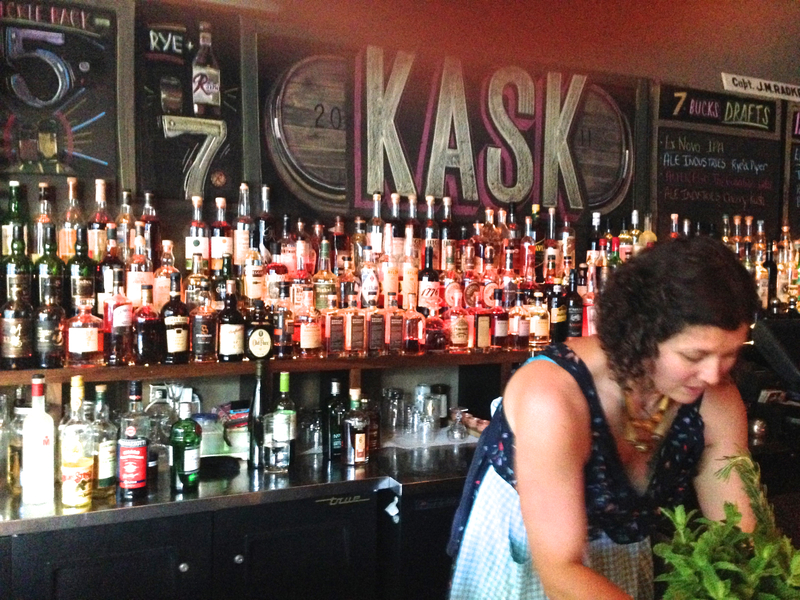 She also urges us to stop into the Multinomah Whiskey Library down the street from Kask. At first we miss the nondescript door with MWL etch above it. We climb a plain wooden staircase and open another door. 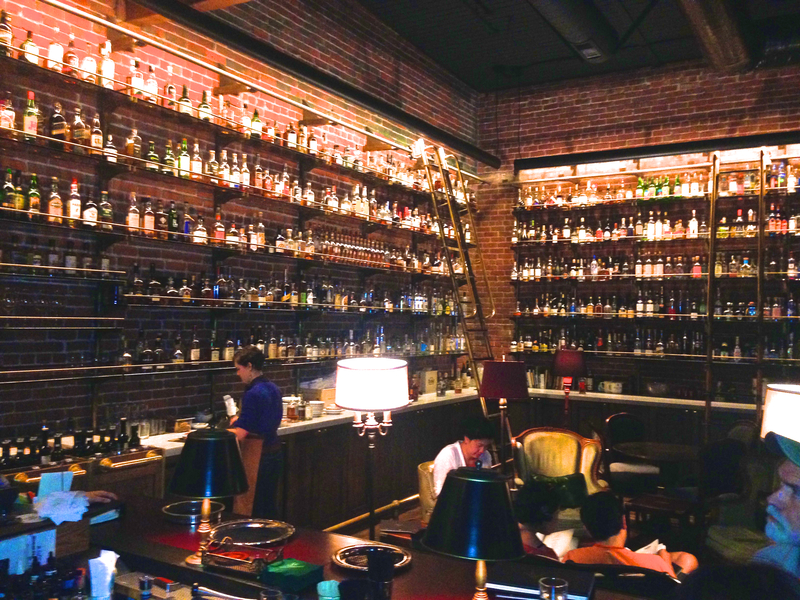 Here, in a huge, elegant room of brick walls and soaring ceilings is Multnomah Whiskey Library. Soft lighting gently shows off spacious groupings of leather armchairs. Well-dressed servers roll lightly tinkling carts of bottles and glassware. We find seats at the bar. While sipping what Bruce says in the best Old Fashioned he has ever had, we watch a bartender use a rolling library ladder to retrieve bottles from a display wall of 1500+ spirits. The predominance is Scotch with hundreds to choose from. Our small plates of sautéed padron peppers and charcuterie appear from the kitchen behind a discreet sliding screen. The bartender tells us that there is never a feeling of crowdedness because entry is by reservation. Apparently, Monday is a good night to just waltz in as we did. As we leave there are a dozen people waiting behind that plain second floor door. The MWL will soon open a casual street level bar called The Green Room to accommodate people waiting for a seat upstairs. Just up the hill the Hotel deLuxe lobby glimmers with crystal chandeliers, gilt and glamour. The romantically-lit Driftwood Room is cozy and the perfect 1950’s hideaway. Seated at the bar is a Don Draper looking fellow drinking “something brown.” This bar is known for their barrel aged Manhattans. We find them in the Hollywood themed drinks menu on the page titled Dial M for Manhattans and Mischief. Their bar bites menu lists 30 options from the classics (Mac & Cheese and Local Steamers) to the weird (Quinoa and Tofu Fritters). It is easy to imagine this beautiful room of curvy warm wood trim and intimate spaces being in Hollywood 60 years ago. Pepe le Moko turns out to be truly peculiar yet inviting. Stepping in off the sidewalk we are in a tiny street level kitchen. A host leads us down to the diminutive subterranean lounge, maybe a repurposed storage space, made intimate by arched ceilings and mellow lighting. The bar has 4 simple metal kitchen stools and there are Formica topped tables and diner syle booths. The music is mid-century soft jazz. House cocktails include Blue Hawaiian and Grasshopper, which seem to fit the decor. The crowd and employees are quite young. They were not yet on the planet when these cocktails were fashionable and the whole place has a “Portland Hipster” feel. We order a couple of drinks not on the house specialties list and spicy shrimp chips. The bartender makes our cocktails with the same care and competence we now expect from a Portland “spiritual” experience. That settles it, I must get back to Portland, although the idea of “strolling to a dozen” watering holes is a practical impossibility. After two, I would be stumbling. Two more…crawling, then oblivion.